In the summer of 1975, people crowded into movie theatres to see the work of a young genius named Steven Spielberg. They watched as a young woman, drunkenly laughing, led her boyfriend to the water’s edge, then began swimming out to sea. She was having a great time – and then suddenly, she disappeared. A few seconds later she reappeared, screaming, gasping and trying to fight, and then she was gone again. The whole thing took maybe ten seconds. Movie goers sat transfixed, still feeling the terror that woman felt in her final moments. For years afterwards, millions refused to go into the water. And they never saw a thing. 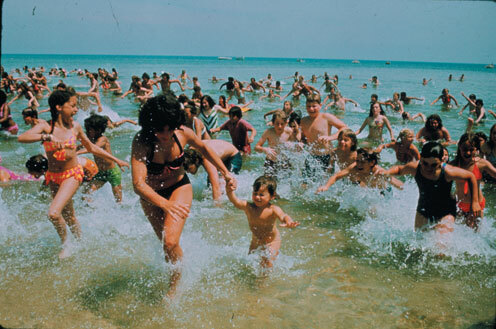 Oh, sure, for the next two hours (and then for three inferior sequels) Jaws turned the sea white with thrashing and red with blood, but no one has forgotten that first scene to this day. Naturally, a classic will have imitators, and shark films have abounded ever since, but none have ever figured out what it was that made Jaws great. 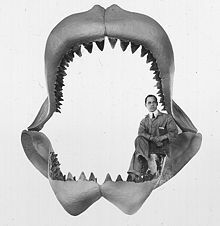 Most have clung to the belief that “bigger is better.” This is probably why there is a whole subgenre of “Megalodon” films. 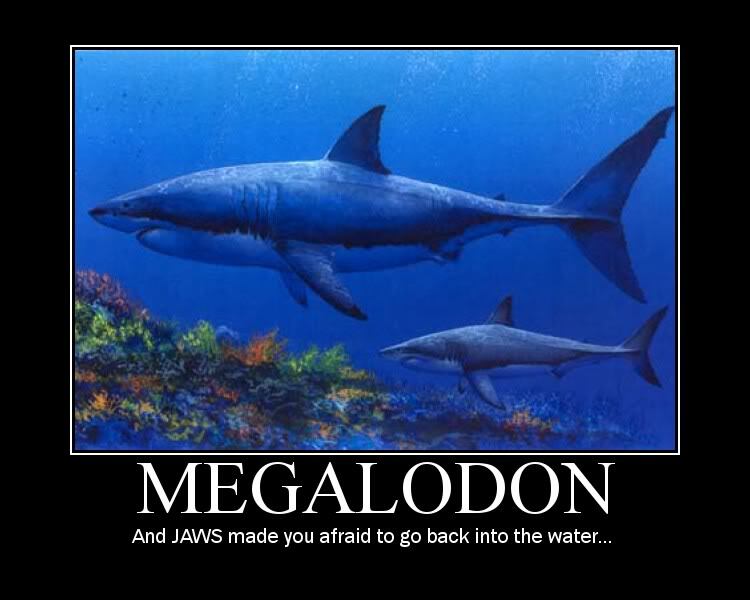 Megalodon, lovingly termed “Meg” by paleontolgists, is thought to have grown to 60 or 70 feet, and to have been extinct for 2.5 million years (Although a 60-foot Great White was reported around 500 years ago). So if a 25-foot Great White in Jaws was scary, a 70-foot Great White is even scarier, right? Sigh. A meg mouth reconstructed in 1909. I decided to get my feet wet in this world of the Hollywood Meg last night and came away with all my toes still attached. I first watched Megalodon, Dir. 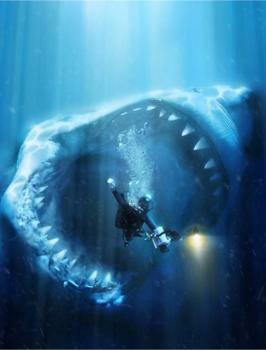 Pat Corbit, 2004 (hereafter Meg) and then Shark Attack 3: Megalodon, Dir. David Worth, 2002 (hereafter SA3). Meg is actually not too bad. You kind of have to get past the fact that they used prehistoric CGI to go with their prehistoric monster, and the fact that the editing is never quite right for building suspense, but the plot is straightforward and not too implausible. Two journalists arrive at a new multi-billion dollar oil rig to cover its first bite into the floor of the north Atlantic. But of course (say it with me now) Something Goes Wrong and the drill sinks into a previously undiscovered subterranean ocean. A few hours later, the rig begins to shake as something big swims out of the hole. Several people go down to check it out and they don’t all make it back up. 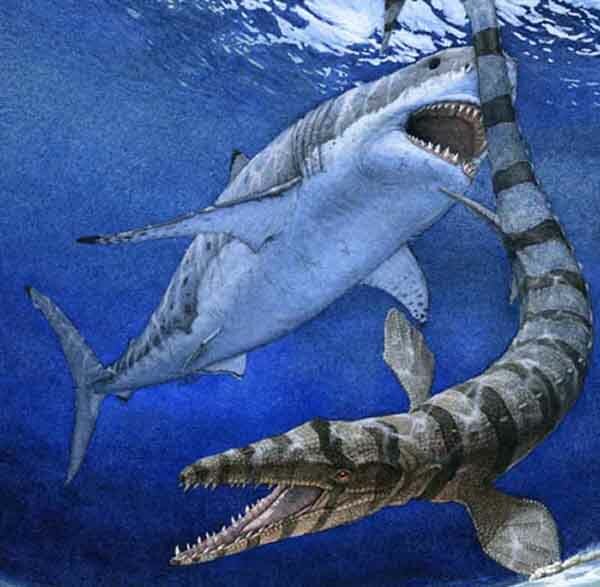 Painting by Csotonyi of a meg attacking a mosasaur. If Meg has a strength, it’s its simplicity. 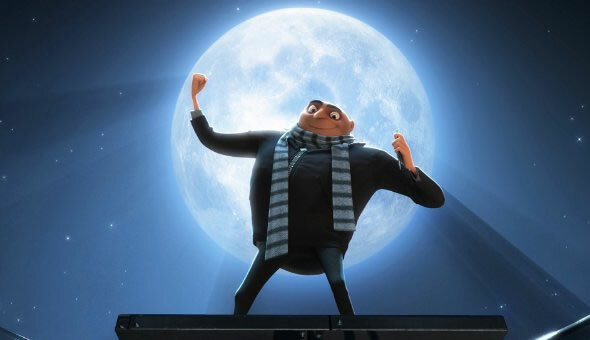 In a 90-minute film, no time is wasted on character development. They give us just enough scenes to understand the general situation and what equipment the characters have to work with before introducing the threat. We are then treated to shots of the shark swimming around, crashing into steel girders and ramming it’s head through ice caps, trying to get at the people on top. These scenes are kind of cool, and in an undersea story, it only makes sense that we see the shark. All this might sound like damning with faint praise, but Corbit does deserve a nod for not trying to do more than he could. The biggest problem is that there doesn’t seem to be any miniature work in Meg. 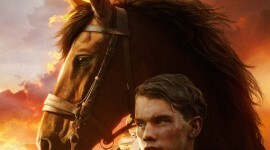 This can be a good thing only if the CGI is flawless, and this CGI is … not. Still, it’s fun watching a giant shark chase a submersible through a maze of I-beams. If there is anything good about SA3, it’s that the overall plot is very well put together. The action centers around a seaside resort in Mexico. It’s not surprising that a millionaire communications CEO (George Stanchev) is staying at this resort. It’s also not surprising that the area happens to be the crossroads for his company’s trans-pacific cable. And it’s not too surprising that the cable’s electro-magnetic pulses have lured a prehistoric shark out of the Challenger Deep, which has followed the cable to this very spot. As parts of large marine animals, and then people, begin to wash ashore at the resort, Ben Carpenter (John Barrowman), a life guard, begins to worry about the safety of vacationers. When he finds a strange tooth in the cable, he sends the picture over the internet. A paleontologist in San Diego, Catlin Stone (Jenny McShane), recognizes the species and travels to the resort to study the meg. Thus it makes sense that all these characters are in the same place because they’ve all been drawn her by the effects of the cable. There’s plenty of conflict between them, too. Carpenter is intent on killing the shark, Stone wants to study it, and the rich guy just wants his system to get up and running. Sadly, this movie has too many millstones around its neck to keep it’s head above water. It’s got the worst acting I’ve seen this side of grade school pageants. It’s downright painful to sit through scene after scene of cheesy dialogue, where you actually see actors turning their heads away from the camera right before they break out laughing (did they not have time for second takes, or what?). The low production values are also something to behold. If it hadn’t been for repeated references to the internet and cell phones, I would have sworn this was filmed in the ‘70s. 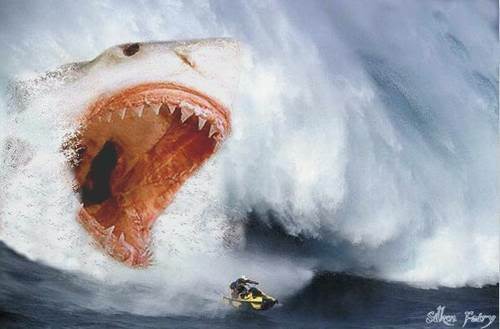 If you think this is real, you'll be terrified by "Shark Attack 3." And of course, we have the token lack of subtly. Right in the first scene, we see a shot of the shark’s face rushing at the camera, and then chomping down on a welder. Later, a couple starts to make out on a water slide, which drops them into the ocean, and they are instantly attacked. No circling to be realistic or build suspense. We see the shark through the whole movie, and – get this – it actually growls! None of it is remotely plausible or scary, unless you’re the sort who has nightmares about being photographed and superimposed over a shark’s mouth. The most pathetic thing about SA3 is that it tries so hard to be Jaws. The main characters go out on a boat and shoot guns and harpoons at the shark, the shark eventually sticks its head into the boat as in Jaws; the movie even copies Jaws 3, when the first meg is killed and then a bigger meg (possibly mom?) appears in the last 15 minutes to attack a cruise ship and swallow motorboats whole. It seems Worth was making it easy on himself with this one, counting on the principle that a movie doesn’t have to be good, as long as there are plenty of scenes of girls taking their bathing suits off.